According to the Chinese calendar, 2019 marks the Year of the Pig, the last animal in a twelve year cycle. The beginning of February sees celebrations for the Chinese New Year around the globe. The exact date varies as the Chinese year uses the lunar calendar. In 2019, the first day of the New Year falls on 5 February. The Lantern Festival closes the celebrations and takes place on 19 February this year. For over two weeks, there will be music, colourful processions or get-togethers, and, of course, delicious food to share. While the New Year’s Eve dinner is probably the most important meal, special dishes are eaten throughout the whole of the New Year period – usually in the hope of attracting good luck. Chun juan (spring rolls), for instance, are a symbol of wealth in the year ahead. There's even a special saying that goes with them: “Huang-jin wan-lyang". The translation means you are wishing everyone "a ton of gold". You’ll often see piles of delicious orange and golden fruits, like oranges, kumquats and tangerines, also there to attract prosperity. Long life is also important – and there’s a special food for that too. “Chang shou mian,” special extra-long noodles, are eaten at this time. They’re often served, usually uncut, in stir fries or soup with sesame and ginger, and they are also popular as a birthday meal. With many dishes, the word for the food involved also sounds like words for wealth. "Yu,” for example, means fish, but it also sounds like the word for abundance or surplus. “Nian gao” rice cakes can be eaten cold, or steamed, or fried, and also represent prosperity in the year ahead. “Tang yuan” are also made from glutinous rice, cooked and served in boiling water, sometimes with syrup. These rice balls are usually eaten at the Lantern Festival, which takes place at the end of the Chinese New Year celebrations. They stand for family and togetherness. Many families and regions have their own favourite dish, but just about everybody agrees that you can't have Chinese New Year celebrations without jiaozi (dumplings). For one lucky person in the group, a dumpling will be extra special, containing a lucky coin - a sure symbol of good luck in the months ahead. 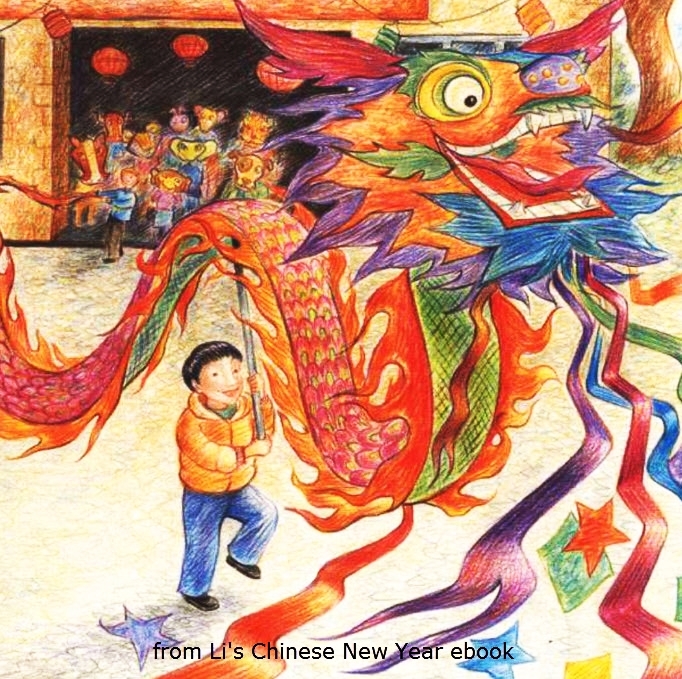 Li's Chinese New Year is a dual language book and ebook publication in English with 10 languages.